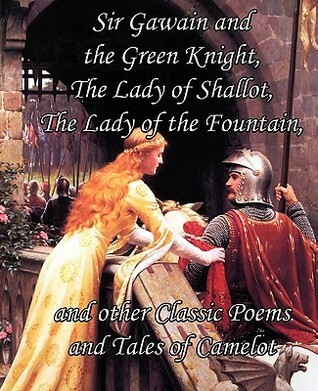 Sir Gawain and the Green Knight, the Lady of Shallot, the Lady of the Fountain, and Other Classic Poems and Tales of Camelot by Alfred Tennyson and more. Published March 14th 2011 by Limitless Press LLC. Stories of King Arthur and the Knights of the Round Table have been told and retold for centuries with each generation adding to the tale and adapting them to fit their times. The Arthurian tales of chivalry, romance, and tragedy have left a lasting impact on English literature. This collection contains Sir Gawain and the Green Knight (trans. 1898), The Lady of Shallot (1833), The Founding of the Round Table (trans. 1914), The Passing of Arthur (trans. 1914), The Morte D’arthur (1914), The Lady of the Fountain (trans. 1877), Arthurian Songs: 1. Avalon (1894), and Sir Galahad, a Christmas Mystery (1858). I purchased this book because I wanted to read about Sir Gawain after falling in love with him on the BBC TV series Merlin (2008-2012). There are so many publications with Gawain in it I picked this one because it also had the Lady of Shallot in it and I could remember Anne reading it in Anne of Green Gables (a childhood favourite of mine) so that was me sold. Sir Gawain and the Green Knight: Even though the language was a little hard to understand in parts, the underlying story always came through. A Stranger, a seemingly evil Knight sets upon Camelot and challenges the knights. Arthur steps forward to take the challenge, but Gawain quickly takes his place. There is lots of descriptive text about the landscapes and changing seasons as Gawain rides out on his quest. Gawain is offered immense valuables from a beautiful queen but turns her down. Later his life is saved because he was so humble and honourable etc. It is a really lovely, descriptive, enjoyable piece of text. I can see myself coming back to read it time and time again. As I was reading it I realised that I had heard the story before, with a piece so old this is not surprising. Where I heard it I’m not sure, I think perhaps in a retelling in a children’s fable. This is actually the start of Part Two (The poem has Four parts). It’s quite a sad poem, beautifully woven and delightful to recite, yes, but essentially The Lady of Shallot was a cursed woman, be it with a beautiful body and beautiful signing voice. She freezes to death while floating down the river to Camelot, singing to her final breath. I’ll come back and read it again, probably after every time I read Gawain and the Green Knight. The Founding of the Round Table: A yule-tide ball that turns into an all-out brawl with people killing each other. I found it a little bizarre; they bury the dead, then pretty much everyone kisses and makes up because Arthur says so. I think the whole point of the poem was how Arthur brought everyone together and always fought for peace. The Passing of Arthur: It starts with Arthur having a dream, which leads to an epic battle between Arthur and Modred. Of course Modred flees and Arthur chases. There is a section in which Wenhavere (I always thought it was Gwenhavere) goes into a convent to hide and never return – at least I think that’s what happened, it was a little confusing. The whole piece swaps between 1st and 3rd persons, it mucks up the flow a bit until you get used to it. Modred is killed in the final battle on the banks of the Tamar River, but hundreds of thousands of others are killed also, leaving Arthur mortally wounded and only two of his knights standing. A boat carrying two beautiful fay women comes to take Arthur away to Avalon. Merlin was only mentioned three times and that was close to the end – he wasn’t even at the fight – this upset me somewhat. The Morte D’arthur: Seems to just be a short verse of Wilfrid reflecting on all the tales gone before. The Lady of the Fountain: She’s Gwenhwyvar this time, so it must come down to artistic licence. The story really kicks off when Owain sets off on a quest to battle the Knight who guards the fountain. He wins the duel and falls in love with the Countess of the Fountain at first sight “the wife of him whom thou didst slay yesterday”. She agrees to marry him so she’ll have someone to protect her dominions, yeah real romantic. It takes Arthur three years to decide to take his men looking for Owain. Owain then abandons the Countess and goes back with Arthur – this is considered a Welsh Romance? What! Anyway, another three years pass and Owain starts to feel bad so he becomes somewhat of a drifter helping out people he meets along his way. Helping out a king here, saving a damsel there and picking up a pet Lion – yes a Lion. In the end he does return to the Countess of the Fountain. He then takes her with him back to Arthur’s Court, and she stayed there with him for the rest of her life. Hmmm while I enjoyed reading this it wasn’t what I’d call romantic. Arthurian Songs: 1. Avalon: Short and sweet, the lyrics flow easily with images of Arthur laying in wait in Avalon. Sir Galahad, a Christmas Mystery: Galahad is weary and takes refuge in a church, he’s in a half daze and Santa Claus (possibly it was Jesus in a red and white suit) shows up. Two angels and four women materialise from nowhere bringing Galahad a bed to sleep in. He sleeps, then they help him dress and send him off to find his father? Launcelot on a boat? Then I have no idea, someone’s found dead or something. Very confusing! I re-read the last four stanzas twice trying to figure the ending out and I don’t care to read the whole poem again to try and figure it out – so for now the Christmas mystery will remain just that, a mystery. All up I’m giving this book Four Stars and this mainly based on my enjoyment of the two largest tales, Sir Gawain and the Green Knight and The Lady of the Fountain, which take the majority of the book.